Save money by using All Aboard Travel’s preferred travel vendors. 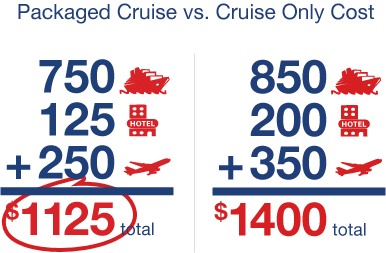 Save time by letting our cruise experts bundle all the parts of your vacation. Spare yourself the frustration of endless online searching for the best hotel near your cruise port, or researching the most affordable airfare and ground transportation. Spend your time instead exploring the sights and fun activities you plan to check out during your vacation. Prices shown are example purposes only.